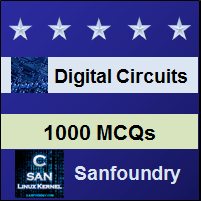 This set of Digital Electronics/Circuits Multiple Choice Questions & Answers (MCQs) focuses on “Magnitude Comparator”. Explanation: A comparator is a combinational circuit that takes two numbers as input in binary form and results whether one input is greater, lesser or equal to the other input. Because, all the input is compared to each other, therefore it is possible only by using 1 circuit. Explanation: A comparator is a combinational circuit that takes two numbers as input in binary form and results whether one input is greater, lesser or equal to the other input. In a digital comparator, only 3 outputs are possible (i.e. A = B, A > B, A < B). So, a – b is incorrect option. Explanation: A comparator is a combinational circuit that takes two numbers as input in binary form and results whether one input is greater, lesser or equal to the other input. In a digital comparator, only 3 outputs are possible (i.e. A = B, A >B, A < B). Other than this, the output will be 0. 4. How many inputs are required for a digital comparator? Explanation: A comparator is a combinational circuit that takes two numbers as input in binary form and results whether one input is greater, lesser or equal to the other input. Thus, there are two inputs required for a digital comparator (i.e. A & B). Explanation: A comparator is a combinational circuit that takes two numbers as input in binary form and results whether one input is greater, lesser or equal to the other input. If A > B, it means that it satisfies one of the condition among three. Hence the output will be 1. 6. Which one is a basic comparator? Explanation: Generally, an XNOR outputs high for even number of 1s or all 0s and outputs low for otherwise. Thus, an XNOR gate is a basic comparator, because its output is “1” only if its two input bits are equal. Explanation: Comparators are used in central processing unit (CPUs). Because all the arithmetic and logical operations are performed in the ALU(Arithmetic Logic Unit) part of the CPU. Explanation: A comparator is a combinational circuit that takes two numbers as input in binary form and results whether one input is greater, lesser or equal to the other input. A circuit that compares two numbers and determine their magnitude is called magnitude comparator. Explanation: A procedure that specifies finite set of steps is called algorithm, While a flowchart is a pictorial representation of the algorithm. 10. How many types of digital comparators are? Explanation: There are two main types of Digital Comparator available and these are: Identity Comparator & Magnitude Comparator. Identity Comparator checks only the equality of the inputs and thus has one output terminal. While Magnitude Comparator checks for greater than, less than as well as equality of the inputs, and thus has 3 output terminals. Explanation: An Identity Comparator is a digital comparator that has only one output terminal for when A = B either “HIGH” A = B = 1 or “LOW” A = B = 0. Explanation: A Magnitude Comparator is a digital comparator which has three output terminals, one each for equality, A = B greater than, A > B and less than A < B. Explanation: A comparator is a combinational circuit that takes two numbers as input in binary form and results whether one input is greater, lesser or equal to the other input. The purpose of a Digital Comparator is to compare a set of variables or unknown numbers, for example A (A1, A2, A3, …. An, etc) against that of a constant or unknown value such as B (B1, B2, B3, …. Bn, etc) and produce an output condition or flag depending upon the result of the comparison. Explanation: TTL 74LS85 is a 4-bit magnitude comparator.